For years, Christians have argued that God gave us free will, with all the potential for sin and pain which that entails, because he wanted children who would love him, and not mere robots who would do whatever they were programmed to do. But these days, many people ask whether that is a false dichotomy. As neurologists and psychologists develop maps of the brain and its various functions, it has become increasingly popular to think of ourselves as machines — and this has had a profound influence on how we understand such concepts as love, free will and the soul. It has also become popular in science fiction — from Bicentennial Man to the androids and sentient holograms on Star Trek — to treat artificially intelligent machines as persons, with the same rights as human beings. These issues are explored in A.I. Artificial Intelligence, a film about a robot child who is programmed to love. The film was written and directed by Steven Spielberg, from a concept developed by the late Stanley Kubrick — which, in turn, was based on Brian Aldiss’ short story Supertoys Last All Summer Long. It is set in a dystopic future, when rising oceans have flooded much of the planet, and couples cannot have children unless their names are picked in a parenthood lottery. Robots already serve as butlers, nannies and prostitutes, and Professor Hobby (William Hurt), an entrepreneurial scientist, proposes making android children which will offer genuine love to the parents who adopt them. These children, he says, will have real emotions and a subconscious mind, but they will also be hard-wired to give their adoptive parents a perfect, everlasting love. One of Hobby’s assistants asks whether people will have a moral responsibility to these robots, should their parents ever reject them, but Hobby dismisses her concerns. After all, he says, “in the beginning, didn’t God create Adam to love him?” Thus, the film raises the disturbing (if not entirely original) question of whether creators — including God — owe anything to their creations. 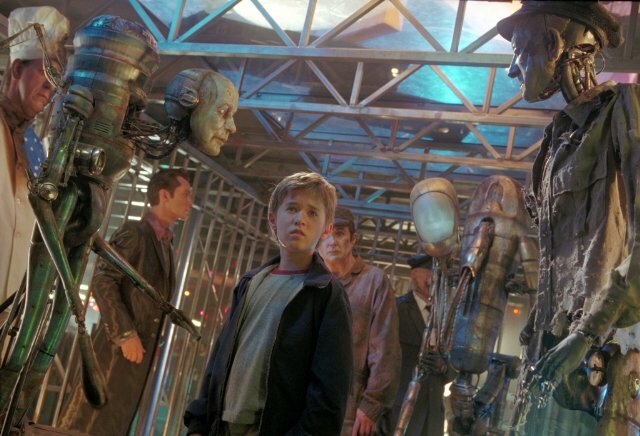 The prototype, David (played with eerie sensitivity by Haley Joel Osment), is sent to live with the parents of a real live boy who is frozen in a cryogenic coma. But then the boy is miraculously cured, and the sibling rivalry that ensues leads to a life-threatening incident that finally compels Monica (Frances O’Connor), their mother, to send David away. By the time she abandons him in the woods, it is clear that, just as Monica has imprinted herself on David’s heart and mind, he has imprinted himself on hers; their separation tears them both apart, and is one of the most heart-wrenching scenes in recent memory. Determined to win back his mother’s love, and inspired by Carlo Collodi’s Pinocchio, David decides to find the Blue Fairy and ask her to make him a ‘real’ boy. But first, he must deal with the prejudices of his robophobic society. And yes, the film does suggest that those who believe there is a qualitative difference between humans and androids may be harbouring an attitude that is tantamount to racism. David is captured and taken to the Flesh Fair, a festival in the woods where humans who feel threatened by androids take sadistic glee in torturing the machines to death. One of the robots in the holding pen mutters that history is repeating itself, and the line evokes memories of Schindler’s List and Amistad — two previous Spielberg films that dealt with racism. David escapes the Flesh Fair and resumes his quest for the Blue Fairy, and in this, he is helped by Gigolo Joe (Jude Law), an eager-to-please android who has been framed for murder by a jealous husband, and is now hiding from the law. Their relationship perfectly captures the film’s central tension between Kubrick’s cold, cynical rationalism and the warm-and-fuzzy spirituality that is typical of Spielberg. David is convinced the Blue Fairy exists, but Joe is not so sure. Joe argues that David’s belief in her may be nothing more than an “electronic parasite” — or a “mind virus,” to use the term favoured by outspoken atheist Richard Dawkins — and the way Joe sees it, selfishness and sensuality are all that really exist, in the end. If Joe’s view of human nature sounds rather bleak, Spielberg does try to hold out the hope that there is a spiritual dimension to our lives that takes us beyond ourselves. But David’s journey is mostly one of disillusionment. Moreover, the love that David supposedly embodies is anything but. If love is defined by personal sacrifice and selfless acts, then David’s love is not quite real, no matter what the ads for this movie say. His need to win Monica’s affection becomes a dangerous obsession that, at one point, sends him into a shockingly murderous rage. His relentless fixation on his adoptive mother has the effect of dehumanizing her and turning her into an object that fulfills his emotional needs.